Tapered Wood Tuning Pegs – Vintage ukuleles, in the old times, make use of round tapered piece of wood that has knob on one end and a slit on the other to keep the string in place. It is very much similar to the tuners used for violins. This type of tuners has served their purpose well in those old times, but has also been known to easily get damaged, and replacing them proved to be a cumbersome task. In the event that wooden pegs slip, all you have to do is just coat them with resin in order to let the friction work again. Vintage Friction Tuning Pegs – By now, you might already have an idea that one of the weaknesses of vintage ukuleles are the tuning pegs consisting of small tightening screws, as well as the plastic tuning knobs which are very easily broken even with careful use. The problem lies mainly on the “crystallization” of the plastic, which in turns results to cracks and splitting of the tuning knob. And since the screws used here are so small, they cannot handle that much stress each time they are tightened. In the current time however, screws used in friction tuning pegs are now made heavier and more durable. The only problem with vintage tuning equipment is that manufacturers do not make a direct replacement for these tiny shaft friction pegs. 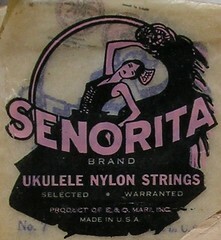 Your best bet will only be at eBay, probably by buying a whole vintage ukulele and salvaging some spare parts from it. You might also be wondering if the newer friction tuning pegs can be used with your vintage ukulele. The answer is a big NO! In order for this to be possible, you will need to drill bigger holes through the headstock of your ukulele. Besides this, you will also need to make some openings for the top guide bushings if you are planning to use the newer tuning pegs. Modern Friction Tuning Pegs are known to have denser shafts, larger tightening screws and more durable and crack-resistant plastic knobs. And because of the bigger and heavier shafts, you will still need to drill a hole that is around 3/16” in diameter through your ukulele’s headstock. Currently manufactured friction pegs also feature a top guide bushing, which is able to support the tuning peg shaft, although this will in turn require an opening to house the bushing. Some tuning pegs, and usually the best ones, also require bottom openings, and they do not rely on the friction between the headstock and knob in order to maintain the tension of the ukulele string. They instead make use of 2 friction chambers in order to keep the strings in place. A good example of this is the Grover 4’s. There are also spring-load friction pegs available in the market. They feature thumb-locking devices in them, sound really well, but are quite cumbersome and tends to add additional weight on the upper portion of the ukulele. Simple Open-Geared Tuning Machines – These multi-geared tuning devices feature a sealed gearbox that is pre-lubricated, as well as top guide bushings. These types of tuners were specifically designed to prevent the ukulele from being top-heavy, which is especially required for soloists.